I walk at night a lot, so visibility is a major concern of mine. 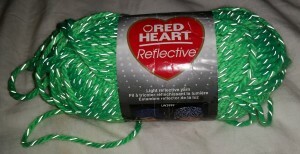 I was really pleased when Red Heart came out with a reflective yarn over a year ago. For a short time it seemed to be available at all the big box craft stores, but now I can only find it locally at the Evil Empire aka WalMart. This is a bulky or chunky acrylic (aside from the reflective material) yarn. While I’m pleased that it exists, I really wish that it was available in thinner yarns, and other materials, specifically cotton. Just because the nights are shorter in the summer, that doesn’t mean people aren’t sometimes out after dark after all, and it’s easier to find patterns for worsted* weight than bulky. 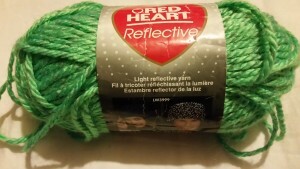 Green reflective yarn, picture taken in a darkened room with flash. Because we had a cold snap in late January, I crocheted my first project in a bit of a hurry so I’d have it when going to the gym. 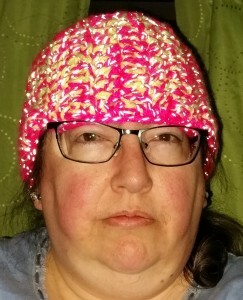 It’s a wide head band following a pattern called a Blissful Ear Warmer available from Red Heart’s website done with two strands held together. I’m not going to bother linking to the pattern because it’s all single crochet worked in rows using an M hook, then joined and edged with a single strand using a smaller hook. Not seeing the need for a copyrighted pattern given something that simple. It did the job, but I don’t recommend it for people who are bald. 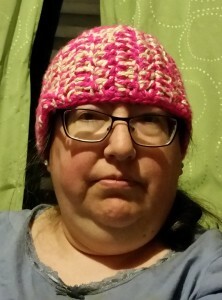 I’m currently working on an actual hat. Details when finished. Disclaimer: Yarn link is an Amazon affiliate link. I get a commission for anything purchased through it, and while I linked to only one color of that yarn, there’s ten colors available.